In just 20 minutes a day my student was able to get a better grasp on Algebra with No-Nonsense Algebra. With concise and easy to understand instructions, math teacher Rick Fisher makes algebra jump off the page for the student. Some students are visual learners and the added video section is a great source for students to be taught by a teacher on the website, reiterating what they have read in the Algebra text. Going step by step the student is able to get a better understanding of the ins and outs of Algebra, a math they are going to need to master to move on into other math areas. Each lesson in the book has a corresponding free video to go along with it. This helps immensely for a parent who may not understand math well themselves, or the child just rather have a different instructor for a class. One thing I loved about the video section is how well it is organized. I tried this initially with my 15 year old who only struggles with some of the aspects of Algebra. He wouldn't necessarily have to start at the beginning of the book working with integers. Each video is labeled and separate so we could skip ahead to where he felt he comfortably needed some help with Algebra. The videos are basically as if the student were looking at a dry erase board at the front of the class. Handwritten and the teacher's voice in the background. You do not see the teacher in the video. This program can be used as your sole Math program, or a supplement and additional work to one you may already own. I am planning on making this the sole program for my soon to be 8th grader. He is a very visual learner and the auditory from the teacher is going to help him focus. Sitting my 8th grader down in front of a math book and telling him to do the lesson is unproductive. He just stares into space and doesn't engage. With the video component of this series I believe it is going to keep his attention much better. Rick Fisher actually asks them to write things down in their notebook and work the problems along with him, great for motivating the lazy or challenging child. No-Nonsense Algebra sells for $27.95 and includes the free video lessons. 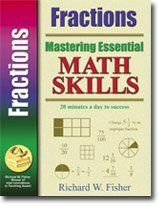 You can order directly from Math Essentials at http://mathessentials.net/order.html. Well worth the cost as each new user in your family can continue to use this one book! Non-consumable if you have your student copy the questions into his/her own notebook rather than write in the book. Mastering Essential has several additional books in their series, not just Algebra. They have Mastering Basic Math Skills geared for grades 5/6 and a second book in the series for junior high. They also have a series of books for the specific area the student may need attention in. "The key to this program's success is that every lesson is fun and exciting. Each daily 20 minute session is short, concise and self contained. Students don't have time to get bored or discouraged. Consistent review is built into lessons so students are able to master and reinforce their math skills. Students can see their progress and this helps increase their confidence and build self-esteem." They have Decimals & Percents, Fractions, Geometry, Problem Solving, Pre Algebra and more. From 4th grade through High school aged students can benefit from this math program. You can easily utilize these resources to help your student master some of the concepts they may struggle with. At $11.95 each these resources are very economical. The workbooks are consumable, which I know is tough on larger homeschool families. I loved how easy it was to keep track of the work all in one book though and well worth the money. This book covers all four operations for fractions. Specific and easy-to-follow instructions ensure that students master the “dreaded” fraction. With consistent, built-in review included in each lesson, students will conquer this topic that gives many students so much difficulty. Each book also contains plenty of practical, real-life problem solving. We had Fractions to review as well and this worked great with my 8th grader on grasping some basic concepts of fractions that he just was struggling with. Being summer he didn't complete this workbook but it is on his course study coming this fall to complete. I am very pleased with the quality of these workbooks and the Math Essentials curriculum. Math Essentials will be offering a special promotion for the months of July, August, and September. The promotion applies to any order placed through the Math Essentials website. Any order that includes Mastering Essential Math Skills Book 1, OR, Mastering Essential Math Skills Book 2, OR, No-Nonsense Algebra, will include a free copy of Geometry (A $14.95 value) plus a free Homework Kit (A $4.99 value).